Listed below are a selection of some of Violins in various price ranges. We are working on photographs and complete listings, check back soon! Many old German & French violins for sale in this price range as well as the ones below. Jay Haide a l’ancienne "Euro"
N.6505 - Robert Dolling, Markneukirchen c.1930. N.8470c - Shaun Fosdick, STL 2012. N.6560c - Tess Stephens, MN 2014. N.6605 - Erwin Sandner, Mittenwald 1947. N.8570 - Fritz Monnig, Germany 1952. N.4545c - Walter Bosswell, MO 1955. N.6955cp - Laberte-Humbert, Mirecourt c.1930. N.8558 - Ottomar Hausmann, Mittenwald 1984. N.8647 - Max Mockel, Germany 1933. N.8693 - Branded A. Claudot, c.1930. N.8692 - Louis Jezek, Ohio 1913. N.8627 - Sanctus Seraphin Labeled, 19th century. N.8685 - 7/8th size Wilh. Durrschmidt, c.1920. N.8649 - Old Mittenwald, 19th century. N.8559c - J. Silakowski “Ropped Purfling”, Kentucky 2019. Antonius Pandolfi Venetiis fecit Anno 1730. Joseph Kreuzinger, Shonbach (i/Bhm.449, Jos. Guarn:1744) 1927. A fine Dutch violin by Charles Crammond, Scotland 1800-1845. N.8708c - A fine Tyrolean violin labeled Albani, from the first half of the 18th century. A fine violin by George Wulme-Hudson, "Carressi" model, London 1923. N.8706c - A fine violin by Kurt Lothar Meisel, MN 1966. A good Czech violin by František Xavier Drozen Turnov 1959. 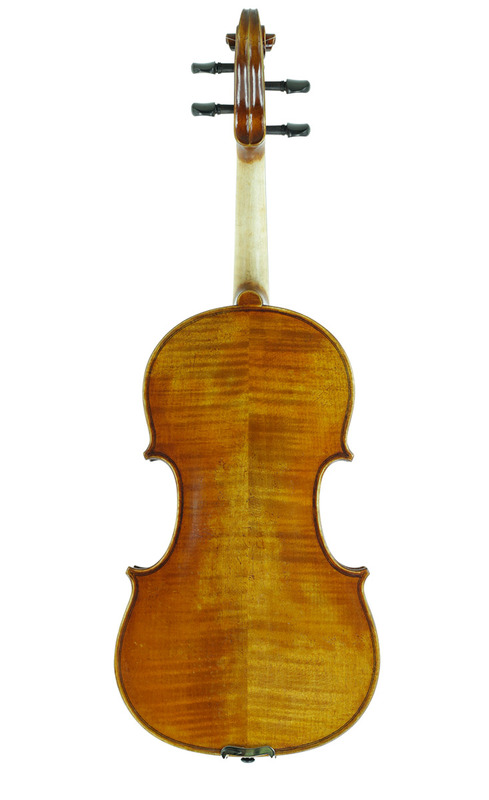 A fine violin by Paul Knorr of Markneukirchen, Germany, from the early part of the 20th century. N.8655c - A fine violin by George Gemunder, Astoria 1882. N.8041c - An American violin by Zenon Petesh, Chicago 1963. N.8659c - A fine violin by Mathias Heinicke, Bohemia 1925. N.8658c - A fine American violin by Joseph F. Ricker, Ohio 1905. N.8238 - Joseph Kreuzinger, Shonbach (i/Bhm.449, Jos. Guarn:1744) 1927. N.4704 - Lyon & Healy "Cremonatone", Leon Mougenot, France 1927. N.4862 - Hermann Geipel, Markneukirchen 1928. 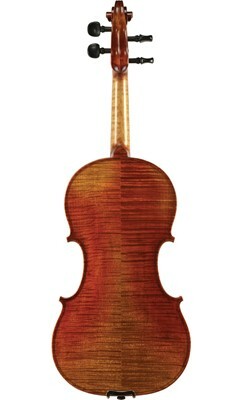 N.6516 - A good Italian violin by Epi Stathopoulo, New York ca. 1903 - 1917. The manuscript label reads Epi A. Stathopoulo, Violin Maker New York [date scratched off]. An oval brand to the right of the label reads A. Stathopoulo New York. Over 30 examples of old German, French, English, and other schools of making.